This month’s hosts live in San Francisco and Dutch Crunch bread is the quintessential white sandwich roll found throughout the Bay Area. I had my first Dutch Crunch bread when I was in San Francisco for Blogher Food two years ago. It was fun to recreate it at home for this month’s Daring Bakers challenge: Lions, Tigers, and Bears, Oh My!. Technically, Dutch Crunch doesn’t refer to the type of bread, but rather the topping that is spread over the bread before baking. In Dutch it’s called Tijgerbrood or “tiger bread” after the tiger-like shell on the bread when it comes out of the oven. The final product has a delightful sweet crunch to it that makes it perfect for a sandwich roll. The recipe is simple, and comes together quickly. The topping is made with rice flour, which is easy to make at home. (At least it was a snap in my new Blendtec mixer. Only 50 seconds to grind rice in to flour!) This recipe for the Dutch Crunch topping came from Rose Levy Beranbaum’s The Bread Bible; an adaptation of a recipe found on Baking Bites. 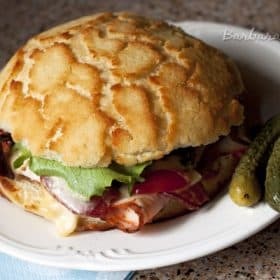 The second half of the challenge was to create a unique sandwich, so I turned to Alison’s, Ingredients, Inc., 400 Best Sandwich Recipes cookbook for inspiration. I had already picked up my favorite peppered turkey from the deli, and knew I wanted to also included bacon. After a quickly scroll through the turkey recipes in the index I found the perfect recipe. The Louisville Hot Browns sandwich starts with layers of turkey, topped with bacon and tomato, then drizzled with a creamy cheese sauce and broiled to a golden brown. The sandwich originated at The Brown Hotel in Louisville, Kentucky and is traditionally served opened faced. It was the perfect compliment to my Dutch Crunch rolls and definitely the best sandwich I’ve had in a long time. In the bowl of an electric mixer or large mixing bowl, combine yeast, milk and sugar. Stir to dissolve and let sit for about 5 minutes (The mixture should start to bubble or foam a bit and smell yeasty). Add in vegetable oil, salt and 2 cups of flour. Mix at low speed until the dough comes together. Knead for about 4 minutes, until smooth and elastic. Turn out onto a lightly floured surface and knead it a few time more and shape it in to a ball. Place in a lightly greased bowl and cover with plastic wrap. Let rise for 1 hour, or until doubled (or more) in size. Once the dough has risen, turn it out onto a lightly floured surface and divide it into 6 equal portions (if you’d like to make rolls) or 2 equal portions (if you’d like to make a loaf) (using a sharp knife or a dough scraper works well). Shape each into a ball or loaf and place on a parchment-lined baking sheet (try not to handle the dough too much at this point). Cover with plastic wrap and let rise for 15 minutes while you prepare the topping. 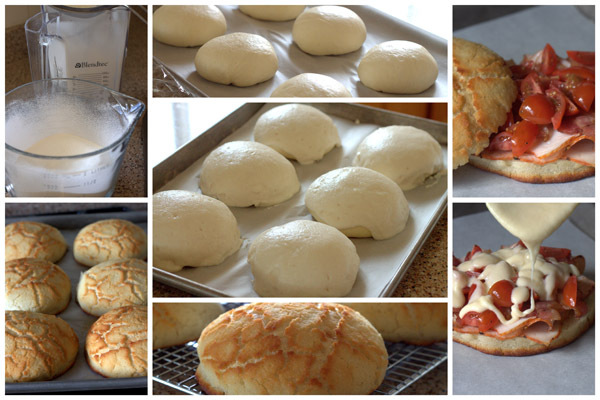 Coat the top of each roll or loaf with the topping (recipe below). Let stand for 20 minutes after applying the topping. Bake in a preheated 380º for 25-30 minutes, until well browned. Let cool completely on a wire rack before eating. Combine all ingredients in a large bowl and beat with a whisk; beat hard to combine. The consistency should be like stiff royal icing—spreadable, but not too runny. If you pull some up with your whisk, as shown below, it should drip off slowly. Add more water or rice flour as necessary. Let stand 15 minutes. Coat the top of each loaf or roll with a thick layer of topping. (I used a scoop to gentle put it on top and then smoothed it with the back of the scoop.) You should err on the side of applying too much topping—a thin layer will not crack properly. Melt butter in a small saucepan over medium heat. Whisk in flour until a thick paste forms. Continue whisking for 2 to 3 minutes until the flour is bubbling. Slowly whisk in the milk. When the sauce is smooth and thickened, add cheddar and Parmesan cheeses and cook for 2 minutes more until cheese is melted. Set aside. Place bottom half of rolls on a boiler pan. Top with turkey, bacon, tomatoes and cheese sauce. Broil 3 inches from heat for 4 minutes or until cheese sauce is golden. Serve immediately. *The Dutch Crunch Rolls were best eaten on the day they were made. Thanks Sara and Erica, the Baking JDs, for a delicious challenge! 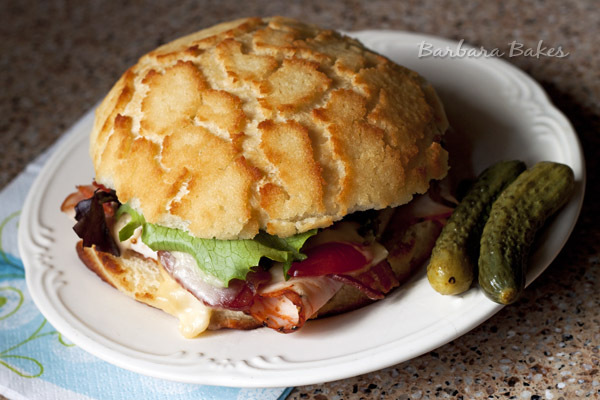 Please visit the Daring Kitchen to see a slideshow of the fabulous Dutch Crunch bread and sandwiches the Daring Bakers created for this challenge, as well as additional tips and challenge recipes.